Theatre, Club and Arena Tour Announced in conjunction with the release of his new rock/pop album, '57th & 9th'. Concerts confirmed in North America and Europe. Special guests: Joe Sumner and The Last Bandoleros. 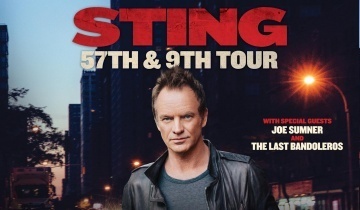 On the 57th & 9th Tour, Sting will be joined by a 3-piece band including his longtime guitarist, Dominic Miller, plus Josh Freese (drums) and Rufus Miller (guitar). Special guests include singer/songwriter Joe Sumner as well as San Antonio-based Tex Mex band, The Last Bandoleros. Tickets for the newly announced 57th & 9th Tour concert dates will go on sale beginning Friday, November 18th through Mon., November 21st. In North America, every ticket purchased online includes a digital download of Sting’s new album “57th & 9th. In the UK, Spain, and France, fans who pre-order Sting’s new album at HMV (UK only) and FNAC (Spain and France) will receive priority pre-sale access to the concert of their choice. Members of the official Sting.com fan club will have the opportunity to purchase tickets in advance beginning Tues., November 15th. Details at www.sting.com/tour. Citi cardmembers can also take advantage of a special pre-sale opportunity for show dates in the United States, including a special “Citi presents Sting: 57th & 9th” concert at the Hollywood Palladium in Los Angeles, beginning Thur., November 17th at 10am through Sunday, November 21st at 5pm (all times local). For complete pre-sale details visit: www.citiprivatepass.com. Ticket purchases limited to between 2-4 tickets per person dependent on venue. Joe Sumner has been honing his solo work for the past five years. While simultaneously fronting rock band Fiction Plane and pushing boundaries in the tech space with his app Vyclone, Joe has been painstakingly stripping back all that he finds inauthentic. This open-minded attitude comes in part from his extremely varied musical experiences - from touring with acts that he literally calls family (The Police, Sting) to artists like Snoop Dogg or singing in a modern opera and writing hits for other European artist. Joe also teaches highly-acclaimed workshops at music schools focusing on the emotional pressures of songwriting. Joe Sumner's debut solo single 'Jellybean' will be released in January 2017. The Last Bandoleros are a four-piece outfit blending Tex-Mex, country and rock n’ roll. Their story begins in San Antonio, Texas with guitarist/producer Jerry Fuentes who, during a musical pilgrimage to Manhattan, chanced to meet New York native, singer-songwriter/producer Derek James. Fuentes and James began collaborating in Brooklyn. But, Fuentes kept being drawn back to his native Texas to record in the same San Antonio studio where a couple of talented brothers were also emerging. Diego and Emilio Navaira, sons of Tejano music legend, Emilio Navaira, Sr., had been making a name for themselves around town for their energetic live performances and sterling vocal chops. Fuentes decided to combine both of his universes by introducing Derek to Diego and Emilio and inviting them to joint-sessions in Brooklyn and San Antonio where riffs and lyrics began flying fast. Newly christened The Last Bandoleros, the quartet began playing live, opening for The Mavericks, Jon Pardi, Josh Abbott Band, Los Lonely Boys and Marc Broussard. Recognizing their high level of musicianship, Sting called upon them to sing backing vocals on his "I Can't Stop Thinking About You" single which soared the heights of radio charts around the world. The Last Bandoleros combine their unique cultural experiences with rare musical camaraderie and, as audiences will continue to discover, their exuberance and joy are contagious. How do we download the album after purchasing tickets? First Sting and Peter Gabriel, now Sting in a REALLY small club in Vancouver. Just got my tickets, can't imagine it getting any better than this. yes!! cant wait for south american dates !!! will be great to see you in argentina again ! TAKING PART IN THE PRESALE? NEW MEMBERS... IF YOU ARE LOOKING FOR YOUR PRESALE CODE, YOU NEED TO BE LOGGED IN TO THE WEBSITE AND VISIT THE TOUR PAGE. YOUR UNIQUE CODE IS ON THE PAGE. Anyone has info on the VIP packages? I cant waitttttt....where can i but where can i buy tickets for.Barcelonaa, Amsterdam or Poland show? I will go to see him in any European country where i can get tickets.. Seems like theybare still not out for sale...right???? Will there be any other Canadian dates added to this tour. I'M COUNTING THE HOURS IN ORDER TO BUY TICKETS FOR THE DATE OF MILAN !!!! I WOULD LIKE TO GET IN TIME TO TAKE IT IN FRONT ROW !!! WE HOPE!!! Yes, New York City. Love. He always seems to be in town around or on my birthday! Great present! !